Wholesale giant Pacific Brands is promoting the benefits of correct sizing and its school shoe brand Clarks, with a specially designed “back to school” advertising campaign and Clarks microsite. The campaign – which features the iconic “first day at school” photo, complete with children in oversized school uniforms – focuses on the importance of correctly fitted shoes, even when all other elements of a child’s wardrobe have been bought to be “grown into”. 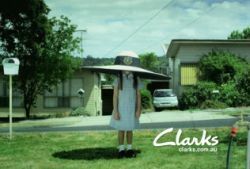 According to coverage in the advertising trade media, Clarks marketing manager, Michelle Maughan, said the campaign, which began rolling out across TV and point of sale on January 10, successfully embodied Clarks’ message. “I’m delighted with the way Whybin\TBWA\Tequila have managed to evoke emotion, humour, and showcase that nothing fits like Clarks school shoes – all in one powerful execution,” she said. Clarks has also rolled out a public relations drive in conjunction with leading Australian podiatrist Brenden Brown, designed to heighten awareness of fitting needs amongst parents.